​The No. 7 Kansas Jayhawks seemed to have a chance to fix their away problems with an "easy" matchup against the hapless West Virginia Mountaineers on Saturday. WVU would be without their amazing rim protector Sagaba Konate and were on a downward skid, having lost their last five games. The Mountaineers came to play, however, and the Jayhawks continued a trend of terrible road performances. When the clock showed all zeroes, West Virginia ended up beating Kansas 65-64. Bob Huggins' team surged in large part due to guard Jermaine Haley. The junior ripped off 13 points, five rebounds, and two assists, while big man Derek Culver also continued to step up in Konate's absence, recording 11 points, seven rebounds, and two assists. The Jayhawks did keep up for most of the game. The score was tied 23-23 at the end of the first half. Dedric Lawson snatched 11 rebounds and guard Marcus Garrett put up 15 points, two rebounds, and three assists. But they just couldn't stave off the home team when it mattered most. It wasn't until the final minute that ​WVU turned up the heat. They scored seven unanswered points with three defensive stops in order to come back and secure the win. 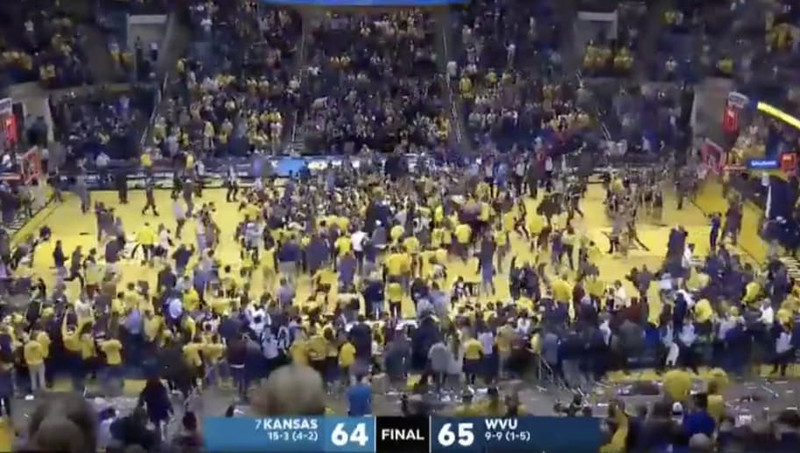 Naturally, the fans in Morgantown had to storm the court. ​​The Jayhawks couldn't find a way to close things out. Sure, they kept the pressure throughout most of the game, but when it really mattered, ​they crumbled. Kansas has now had a meltdown in three of its four true road games. West Virginia, on the other hand, secured their first win in the Big 12 this season despite missing their biggest star.